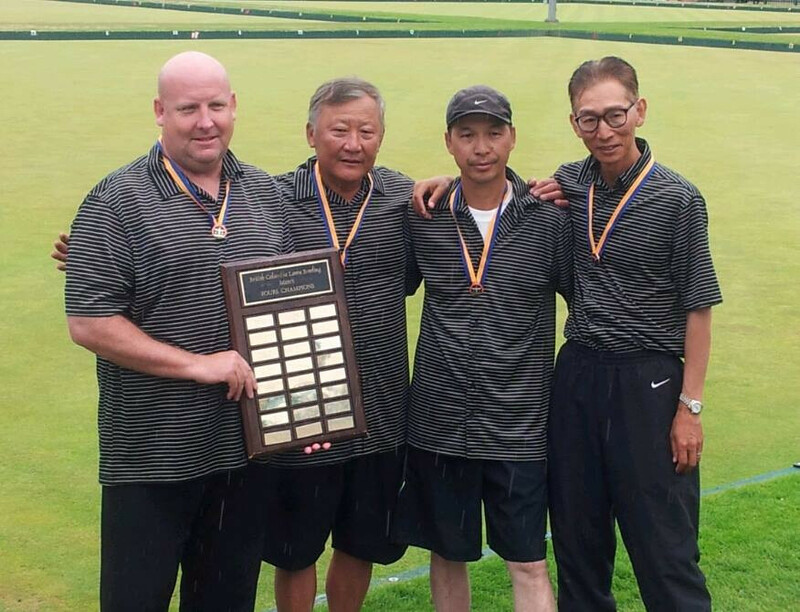 The July 4th weekend saw the completion of the first of three major Provincial championships, the Fours. 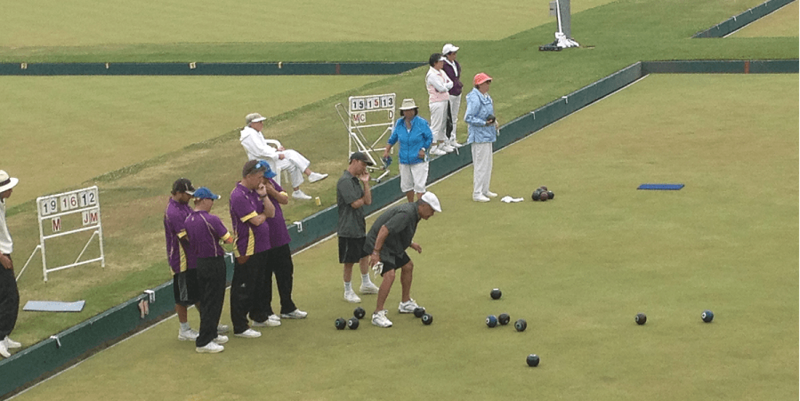 Both Men’s and Women’s champions went undefeated against eight other teams, on each side, in the double knockout playdown held at the Juan de Fuca Lawn Bowling Club. 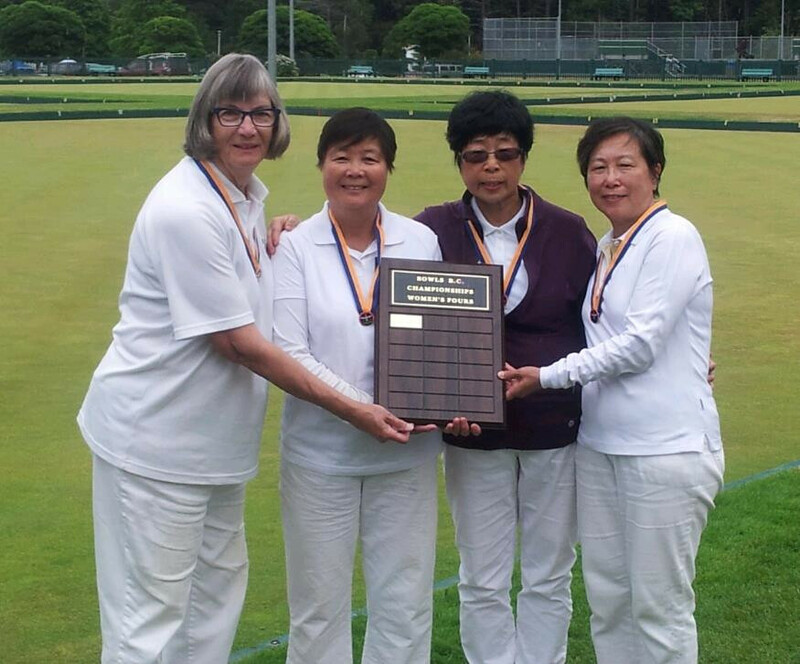 In the Women’s championship, Skip Marlene Cleutinx with teammates Josephine Lee, Sandy Yau and Rita Patterson fought their way back into the game after slipping to a multiple point deficit early. But in the final end it was Cleutinx who was leading 18-15 over the Elizabeth Day Rink. Though the Day team was able to sit three shots to tie, Cleutinx – with one bowl left – mustered up her experience and drew the shot for the win and the right to represent B.C. in Winnipeg. Day still had one more bowl but couldn’t remove the Cleutinx bowl and picked up the Silver alongside Rosemary Waldie, Mary McConnell and Neva Hawkes. On the Men’s side it was the Rinks of James MacGowan against Cary Manns. MacGowan and teammates, Jon Braun, John Aveline and Michael Leong started strong, taking an early lead and showing promise to push the final into a second game. But Manns, Vince Mai, Kin On Lau and Clement Law were able to ‘keep putting them in there’ taking off in the last half and coming home with a six shot lead. They secured their trip to Nationals by grabbing another shot on the last end for a 20-13 final. This upcoming weekend will be the Triples playdown. Once again a mix of B.C.’s best will be back to throw three bowls each. Notably MacGowan with defending B.C. Triples Champion Braun who have have teamed up with Bill Mason. Also, 2013’s national silver medalists German Santana and Malcolm Taylor will be back – with substitute George Cubiss for Mel Eccles – looking to avenge their 0-2 performance in the Fours and defend their Canadian 3s title. The path is clear for Diane Fulton’s defending B.C. Triples Championship team with Jenny Siu and Shirley Lai who also picked up Silver in the Canadians, as Cleutinx, last year’s National Gold Triples medalist, will be playing for B.C. in Fours. Cleuntinx and all other Fours champions are not eligible to play in any more major playdowns this year. A total of 15 men’s teams will be playing at the Nanaimo LBC while eight women’s teams will be at the Courtenay LBC this weekend, July 11-13. Games start at 10am.